Am I the only one who still has a land line in their home? With terrible cell reception in our house, I insist on keeping a land line. But that leaves the question where do you put it? Our den has this tiny little corner where the line is connected. With our huge sectional sofa dominating the room, there’s not much room for other furniture. But I needed a table for the phone that was sitting on the floor. 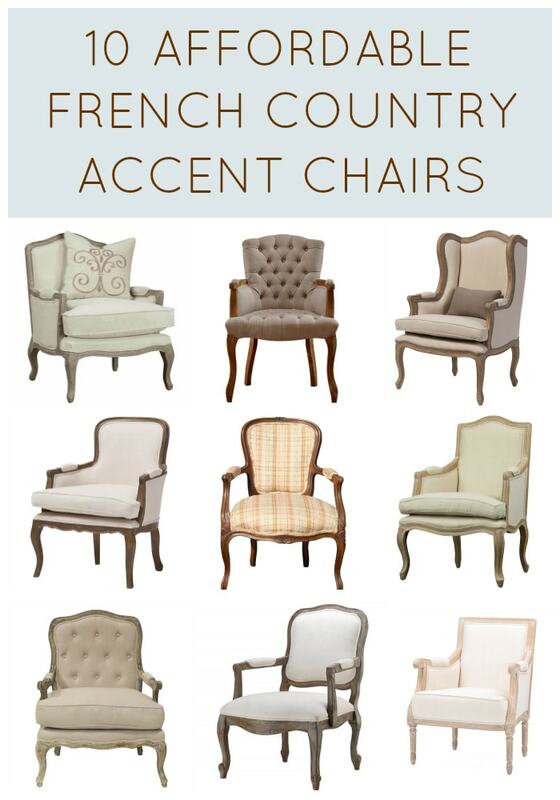 My challenge: how to choose a French Country accent table for a small space? I actually searched around quite a bit before I found what feels like the perfect solution. First and foremost it had to fit with the character of our decor. It also needed to be quite small and finally, as an add in to a room that had already reached its budget, it needed to be priced well. 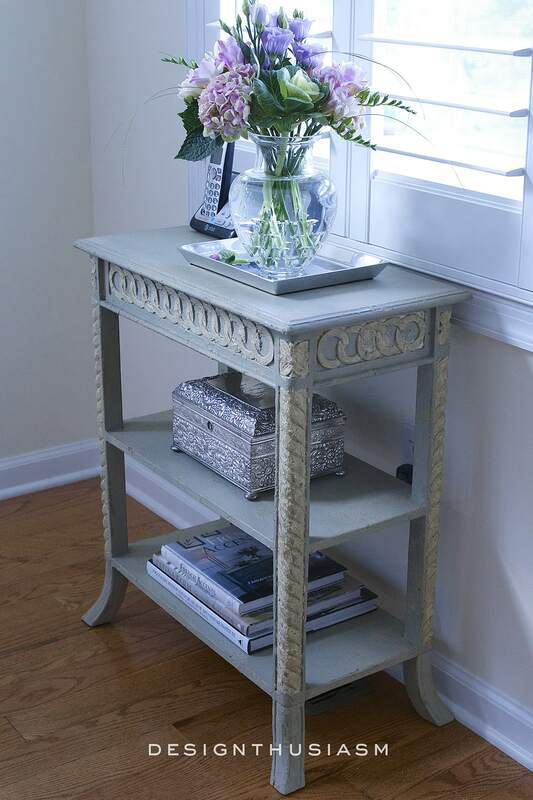 I found this wonderful little table (affiliate link) with a distressed painted finish that I could tuck right into the corner and still have enough room to walk by. 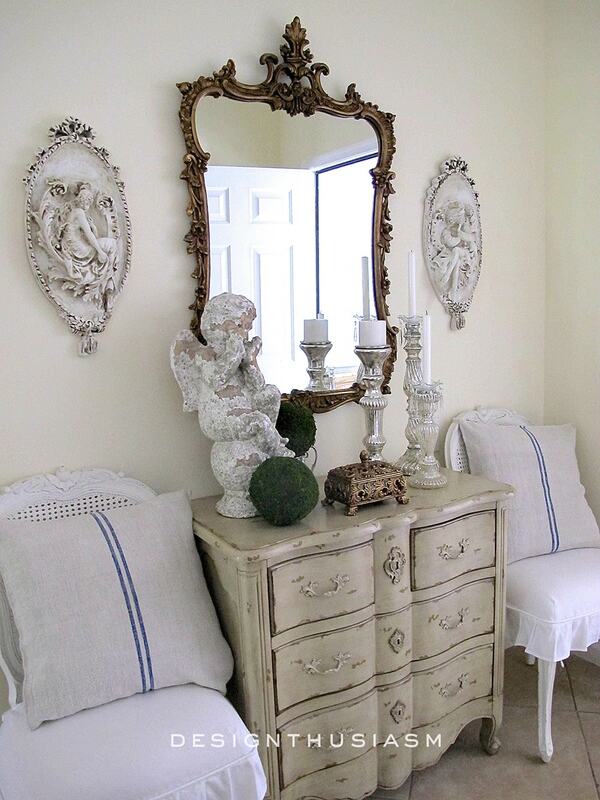 It’s really more Gustavian Swedish than French Country, but I love the two styles mixed together. We have a similar chest of drawers in the guest room that blends well with our style. 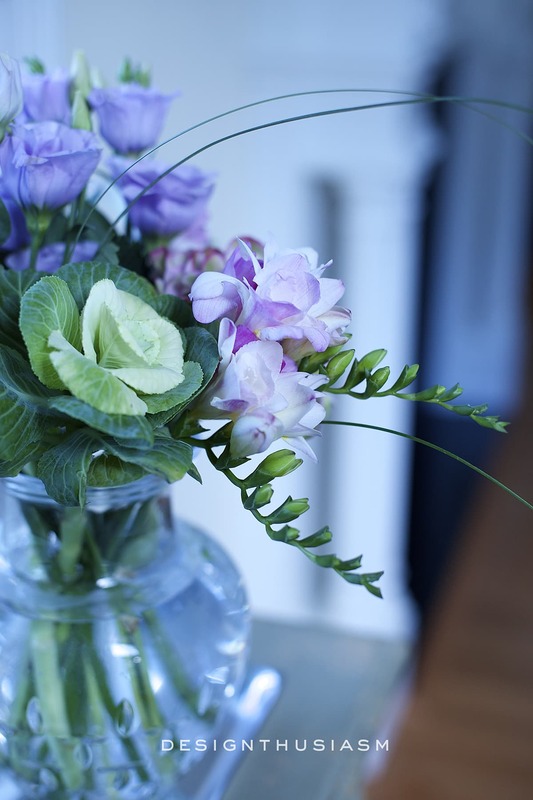 Its location right under the window makes it the ideal spot for fresh flowers and I was delighted to head to our local flower shop to gather together this sweet little arrangement. As a complete neat freak, I always love when the pieces I buy offer a place for extra storage. 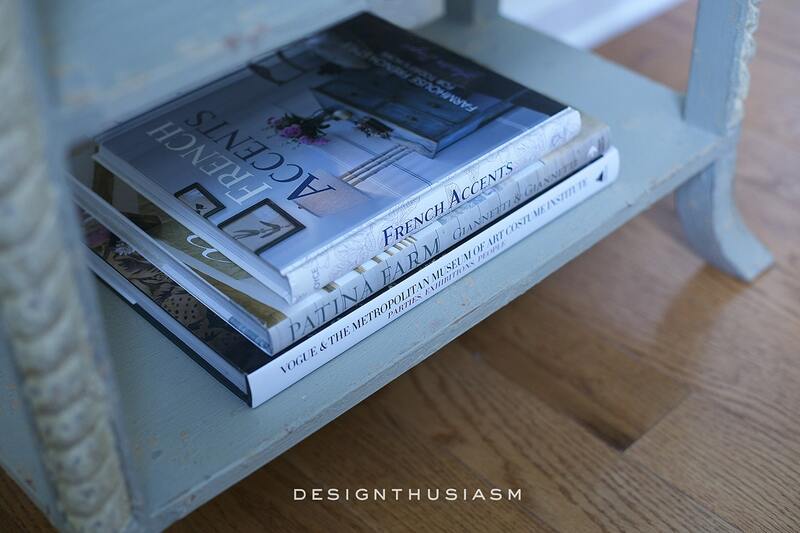 I have lots of design books and I enjoy having them within reach, so the little shelves on this table are an extra bonus. 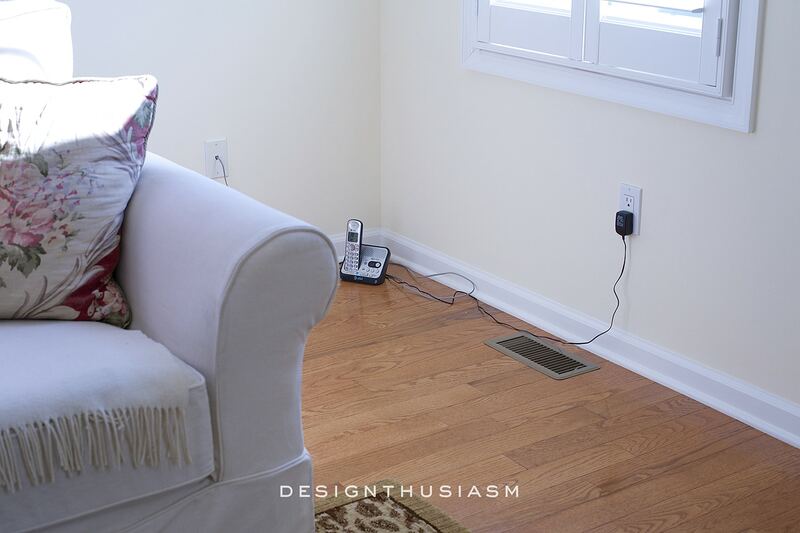 Of course the primary function was to provide a place to keep the phone, and while I don’t love the look of technology on my pretty furniture, I’ve embraced its usefulness and determined to make it work. Next up will be to change out this old coffee table, so be on the look out for another change sometime soon. 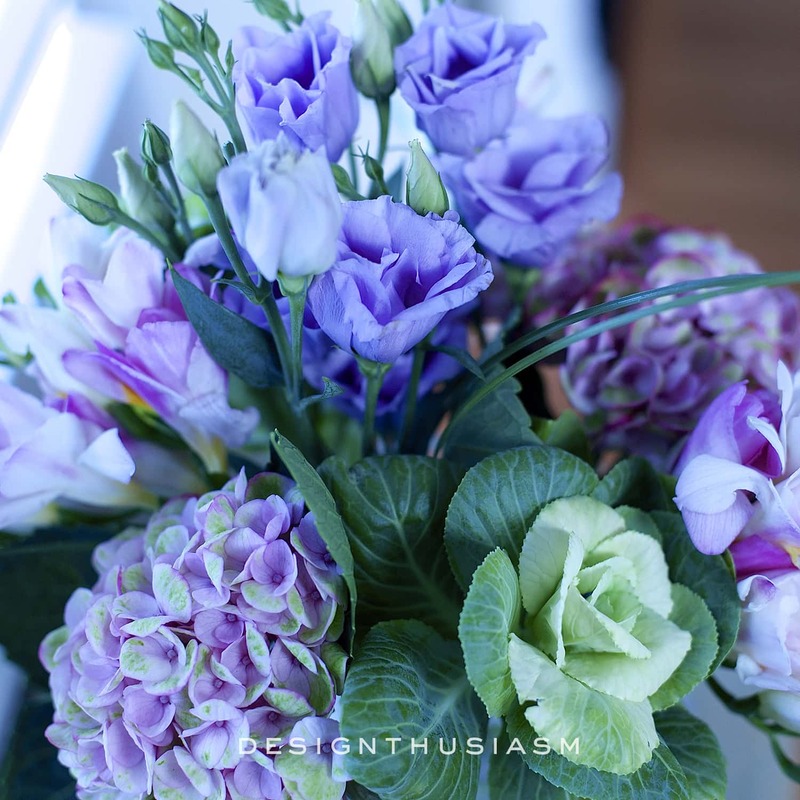 For color and interest, the floral arrangement includes lisianthus, pepper hydrangea, brassica and freesia. I love your table Lory!! The book on the table looks awesome, and I also noticed the Nest candle. Nice!! Thanks, Anita! I love your book and it’s always displayed on one of my tables… 🙂 The Nest candle was a gift from a friend and I just love the bamboo scent!! The new table is fabulous! But hold on a minute about the coffee table….I actually really like the one you have. If you need a new look, it could be painted and distressed, but I love the style, shape, and scale of it. Just a thought! 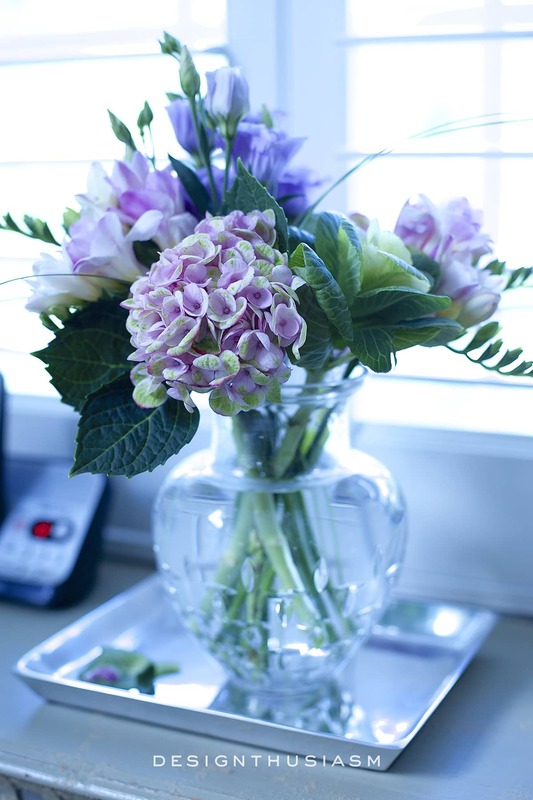 Lory, your table looks beautiful! I love its details and color. Your living room is looking gorgeous. 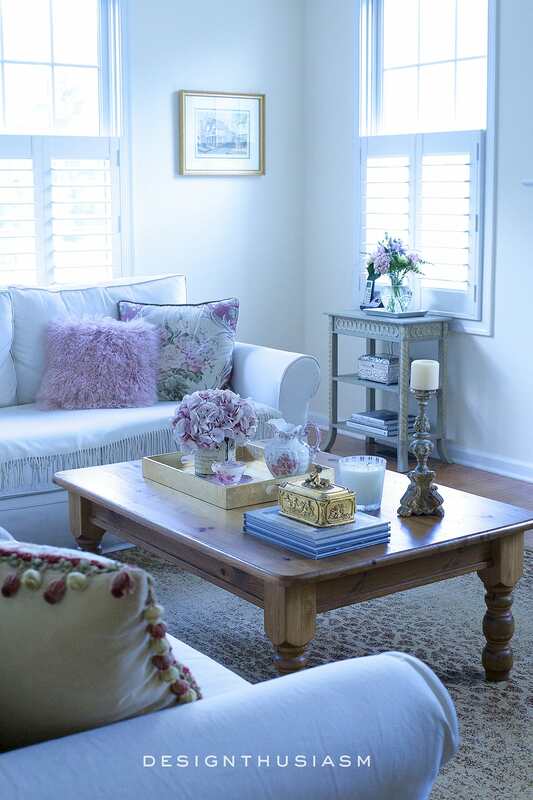 I can’t wait to see the new coffee table that you are going to choose. I cannot wait to tell my adult children that I am not the only person in America with a land line.? Love your table. I like the coffee table you have,I won’t tell hubby. If you want to change it I think maybe a pretty metal and glass. Lol… yep, my kids do not have land lines and never answer it when they’re in our house. 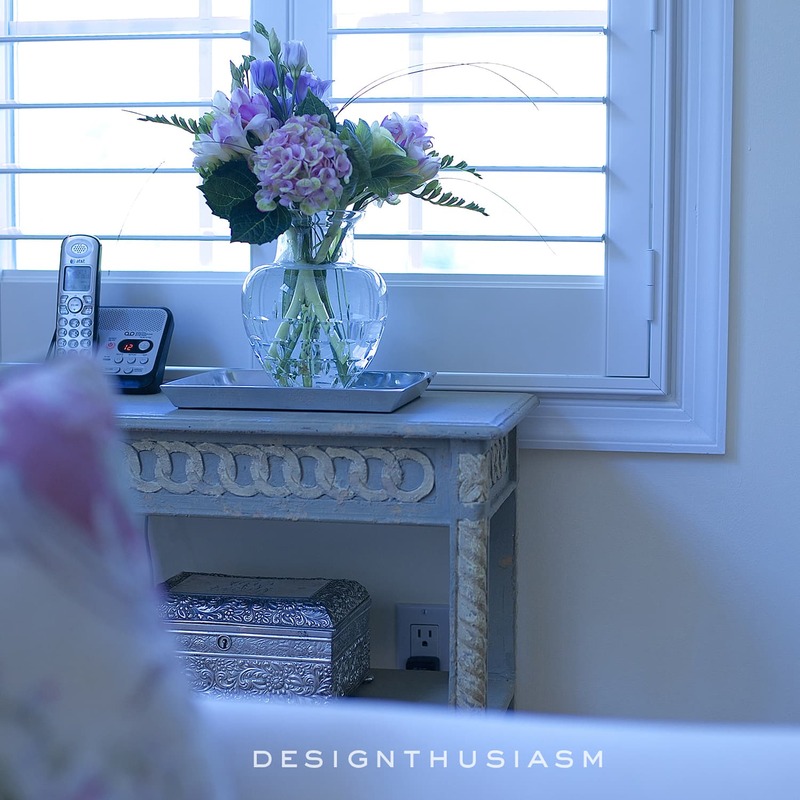 BUT when they call us, they often call the land line because the reception and sound is so much better… 😉 Re the coffee table, right now I have 3 choices I’m thinking about and metal and glass is one of them. I may do a short post proposing the ideas and see what people think… 🙂 Thanks for visiting!! Lory, I love your solution! You hardly even notice the phone. What a great little table! At least, we no longer have to worry about where to hide the Yellow Pages! Nice! Thanks and omg, I forgot about the phonebook! Ha ha, how funny that we used to have to deal with that… 🙂 Thanks for stopping by!! Lori, it looks great! I’m thinking of a classic glass with gold metal frame. 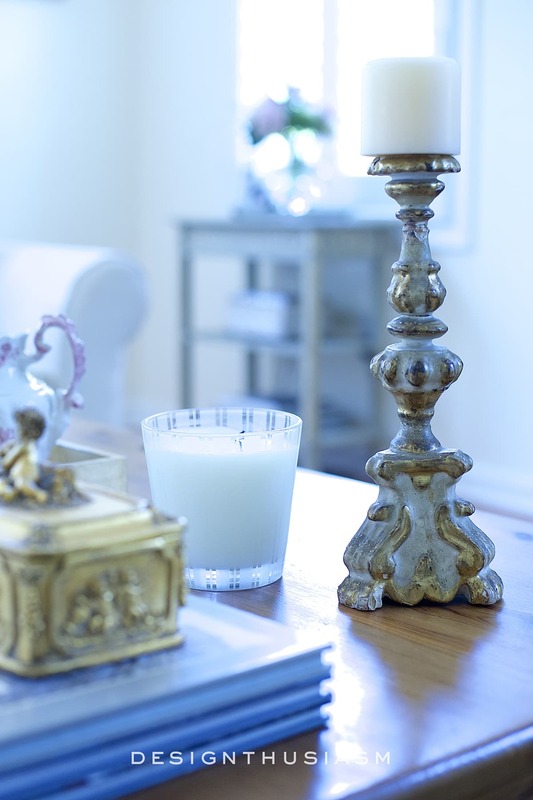 Something with a little bling that you brought from your Parisian home to you “country chateau”. I think you’d have more visual space with that. Something about mixing glass, bling, and chippy patina that just WORKS! 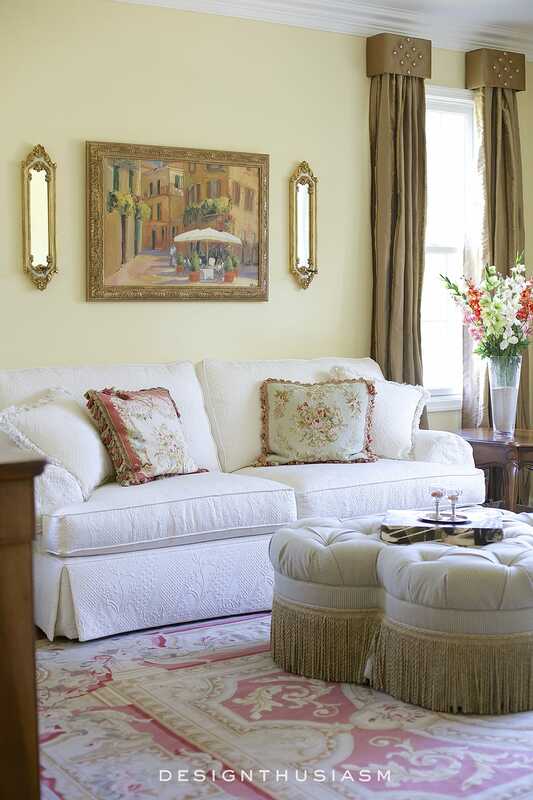 I noticed in another picture on your blog the ottoman with the fringe that you have. I can’t help but be curious how it would look in here. Seems like it might be fun with the rug you have in this room. Of course I can’t be sure about coloring etc….just a thought! I love to try things in new places. Otherwise glass and metal seem like a good way to go too! That’s actually funny Liz, because I did think about that ottoman in here! But I don’t think the colors would go and then I still need a table for the living room. The other issue is we use this room and table so much, that I’m afraid a soft fabric table will be less functional. I actually have another long narrow tufted ottoman in the study, which would be a great shape to coordinate with our long sectional couch, but for the same reason, I’m afraid it won’t work. I may try it out for a bit though… 😉 Thanks for your input!! For your coffee table I suggest a glass with an antiqued gold trim. Had a big chunky wood like yours in my den, but when I went French county in that room I did one as described above. Love it!!!! Just what it needed. It dressed it up a little and gave the room some safistication. Wish I could send you a pic. It is oval so it fills up the space still leaving just enough room to navigate around. Glass in the middle edged by the metal painted/antiqued gold look with beautiful curvy legs. And even better….a consignment find. Can it get better…1/2 price! Made my day. And it is PERFECT for the room. Hope you have as good of luck as I did in your search. Oh and P.S. 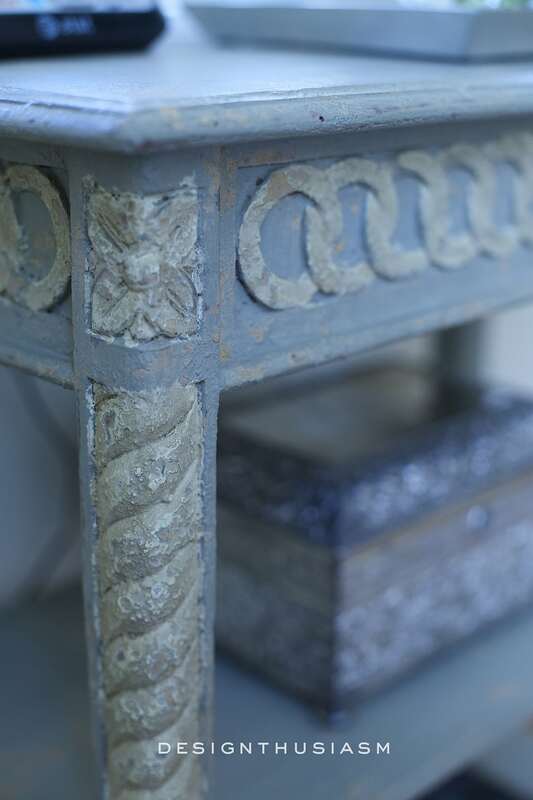 Searched the world over for my perfect piece and found it when I took my old coffee table in to be consigned. Happiness is! Love you story about the consignment table and yes, that sounds a lot like what I’m looking for. Although my other choice is kind of Gustavian. It probably will depend on what I happen to find in my searches. Thanks so much for stopping by! Love your new find, Lory, and that you placed the piece under the window rather than next to the sofa as most would have done. 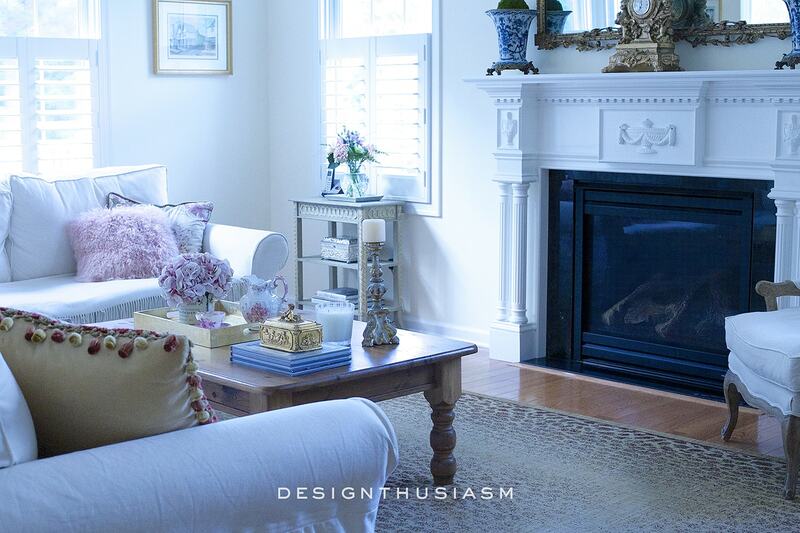 I’m so enjoying getting to watch your beautiful home evolve, and have gotten terrific ideas. Hugs! Greetings from Colorado! The little table looks great under the window and is practical to boot. I found a similar table at Goodwill that is holding my CD player and a wire basket of CDs with a trio of aqua mason jars on the top. Wasn’t sure where it was going to live when I bought it but little tables always seem to find a home. I like your current coffee table…maybe paint it white and lightly distress it? The touches of pink are perfect. P.S. I still have a land line and may use my little table for it sometime! Pretty, Lory! Sweet table under the window WORKS. I agree with your decision to swap out your coffee table. It has good bones, but to my eye, the scale is a bit too large and the finish reads a bit heavy. What I can see working beautifully is a ROUND coffee table to balance some of the room’s otherwise linear shapes. Material options are wide open: upholstered with a tray; metal and glass (but the dusting and windexing! ? ), or to prevent the room from becoming TOO sweet, perhaps a wooden cable or wire spool (either left quasi-industrial with its own wood tones or softened/reworked as you prefer … Paint, book pages, sheet music decoupage, typography, etc.). While not technically a “shelf,” the lower part of the spools still invite merchandising, display of books, etc. It will be fun to see what you do! Thanks for all the input, Cindy! These are all great ideas… 🙂 I’m still unsure, but we’ll see, hopefully soon. That table to absolutely lovely. I love the detail. It fits right in and the phone has an elegant table to live on. The perfect table for that space…it’s beautiful! Love the table! No landline here anymore! It’s perfect and I love the detailing. We have a landline too. With above-ground power lines and living on a windy island we keep the landline because it works in a power outage long after cell phones lose their battery power. I love your little table and I’d think again before replacing your coffee table. Why not paint it?